A lot of us remember growing up in the front driveway playing basketball with our dads. It seemed that no matter how hard we tried, dad would do just enough to pull off the win. That’s what motivated us though, that’s what kept us out there long after the sun went down with the rim barely visible by only the flood light on the garage. But what if your dad was B.J. McKie, USC's all time leading scorer, whose number 3 jersey was retired at South Carolina? What would it take to ever pull off the win? Living in the shadow of dad must have taken some getting used to as Justin progressed in his own journey on the hardwood. Constantly being compared to and asked questions about his father. Even though there was a struggle and challenge for Justin to make a name for himself, he has done just that. As a senior he led the Yellow Jackets to a second straight state title scoring 20 points and pulling down 10 boards. Justin averaged 18 points and 4.5 rebounds during his senior season, helping Irmo finish with an undefeated record of 29-0. After the season McKie was named both the SC Gatorade Boys Basketball Player of the Year and SC Mr. Basketball, an award shared by his father BJ, who won it in 1995. 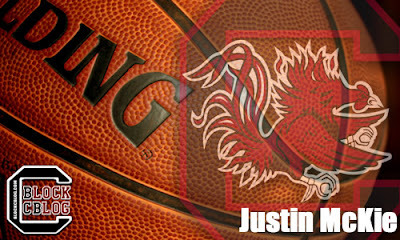 Justin McKie is an important part of a much anticipated basketball class of 2013. When Frank Martin was asked about Justin he said, "We really like his toughness, his ability to play defense in a system that is similar to ours and his length and size on the perimeter." McKie is also a scorer and knows exactly what to do with the ball in his hands and playing for the legendary Coach Whipple should help a lot in the transition from HS to College. Gamecock fans are very excited about this years class and can't wait to see it all play out next season. We caught up with Justin and asked him a few questions in this installment of "On The Block". BCB: What Jersey number would you like to wear at Carolina? McKie: I would love to wear the number 21 because I've worn it all throughout high school. BCB: Who would you say you model your game after if anyone and who is your favorite current NBA player? McKie: I try to take things from different players, I don't have a comparison. My favorite player is Kobe Bryant. BCB: How do you feel you, Sindarius Thornwell, Desmond Ringer and now Demetrius Henry will make an impact during the 2013-2014 season? McKie: I feel we'll all go in looking to help turn things around. We are all winners at the high school level and will bring that attitude to USC. I've played against all of them and they have really good skills and are really good basketball players. I'm looking forward to playing with those guys. BCB: How was it playing for a legendary HS Coach like Coach Whipple and do you think playing for him will help you prepare to play for Coach Martin? McKie: It was great I learned a lot about the game but about life as well. I think it will, because they both coach somewhat the same. BCB: How excited are you to play basketball at the collegiate level and what are you most looking forward to? McKie: I'm extremely excited about it. The thing I'm looking forward to the most are getting to know my teammates and winning games with them. BCB: Other than following in your fathers footsteps, what solidified you decision to transfer from Ridge View High and committing to the University of South Carolina? McKie: I transferred from Ridge View because I had always wanted to play for Coach Whipple since I was a kid. My biggest reason to committing to South Carolina was so family could see me play; the second biggest was I believe in Coach Martin and what he's building. BCB: What are your personal goals as a freshman Gamecock? McKie: To get to the NCAA tournament, grow as a basketball player & work and play hard to earn significant minutes. BCB: How special of a year was it for you personally last year at Irmo, what will you miss most about High School? McKie: This year meant a lot to me personally. I was able to tie my dad in state championship rings and make history with my brothers. I don't play for individual awards, but winning Mr. Basketball and Gatorade POY was special for me. I'll miss playing with guys I grew up with and Coach Whipple the most. BCB: We know all about your Dad's accomplishments but we want to know more about Justin McKie, what do you want the fans to know about you and your game? BCB: Who would win one on one between you and your Dad? McKie: I feel like I could get him.